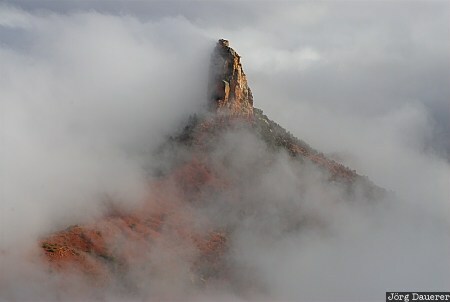 Fog and afternoon Light on Mount Hayden, seen from Point Imperial on the north rim of Grand Canyon, Arizona, United States. This photo was taken in the afternoon of a rainy day in October of 2006. This photo is part of the exhibition Fog (October 2008). This photo was the image of the month in April of 2012. This photo was taken with a digital camera.